Reading Halloween books this week to a few classes makes me want to share some Halloween book love. 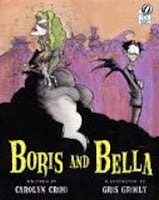 Halloween books give me special credence to use all sorts of fun/scary voices for read-alouds! Students are thrilled as I stomp around our reading circle. 1. The Perfect Pumpkin Pie by Denys Cazet: I love pie and this book makes a great read-aloud about a dead man's love for pie. This book has a marvelously fun refrain about pumpkin pie with delightful illustrations. 2. That Terrible Halloween Night by James Stevenson: Louie and Mary Ann think they have Grandpa tricked when he doesn't know that October 31st is Halloween but it's really Grandpa tricking them. Kids love the speech bubbles in the illustrations and the ending had everyone thinking!! 3. 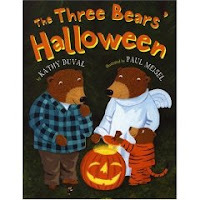 The Three Bears' Halloween by Kathy Duvall: Mama, Papa and Baby Bear dress up for Halloween and trick-or-treat around the forest. When they find a house door open they venture in...A funny take on Goldilocks, kids love it when they figure out the story is the reverse of the original. 4. Where's My Mummy by Carolyn Crimi: Little Baby Mummy wants to play one more round of Hide and Shriek and runs away from Big Mama Mummy. When she doesn't come looking for him, he has to search for her in some unusual places. John Manders illustrations show us a perfectly creepy graveyard with a wildly un-frightning but fun cast of characters. This also has some easy repitition for young ones to repeat with you. 5. Boris and Bella also by Carolyn Crimi: A romantic tale of a friendship that forms between Bella Lagrossi and Boris Kleanitoff-one messy and one tidy vampire, both wishing to host a Halloween Bash. Everyone heads to Harry Beastie's party instead as he's neither messy nor too clean. Cris Grimly illustrates this one for Crimi and they are perfectly spooky! Crimi is the only author on this list to have their own website...such a shame!! I think it should be a requirement for publishing houses to get a website up and running for an author with a few books under their belt, at least! [soap box moment] I discovered this interesting interview with Crimi at Make It Better, a North Shore publication. What Halloween books have you spooked? I'll be back this weekend with a photo celebration of our own holiday fun including an up-date on all my pumpkin seed roasting trials. My groovy girl is Ladybug Girl and again I shout from the mountain top how hap, hap, happy I am that she chose a book character herself!! Go Young Happy Reader Girl!! !